Welcome to Chicago! As you gather this week at a major climate summit, I hope you will make the most of your time in one of the world’s best food cities. Try the popcorn, the Chicago dogs, the deep-dish pizza and the haute cuisine. While you’re savoring, it would be fitting for you to discuss how to fight climate change. That’s because food – and the amount we let go to waste – presents a real opportunity for mayors. More than 1 billion tons of food (about a third of all that is produced) goes uneaten each year. 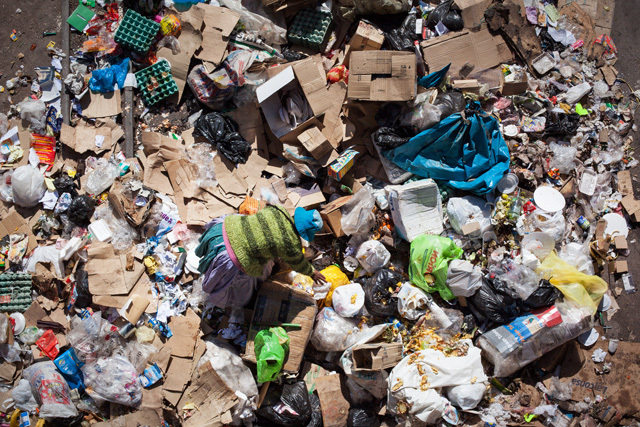 Food that is lost or wasted is responsible for 8 percent of global greenhouse gas emissions. 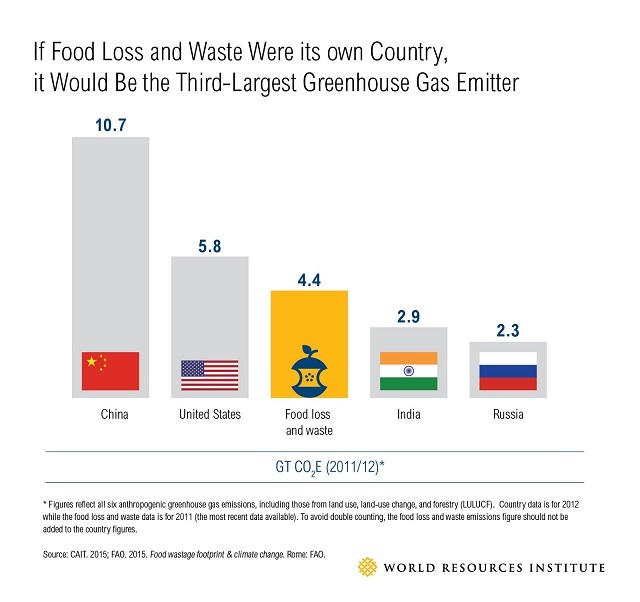 In fact, if it were a country, food loss and waste would be the world’s third largest emitter, right after China and the United States. Helping households, businesses and others get a handle on food waste doesn’t just make sense for the planet. It can also be a money saver for cities. Earlier this year, a report from Champions 12.3 – a group of CEOs, government ministers and other leaders, including myself, who are all committed to halving food loss and waste – presented a case study from London’s experience. In 2012, six London boroughs began an initiative to reduce the amount of household food waste. Efforts included radio and print outreach, tips on correct food storage, community events, food waste measurement and monitoring, and more. 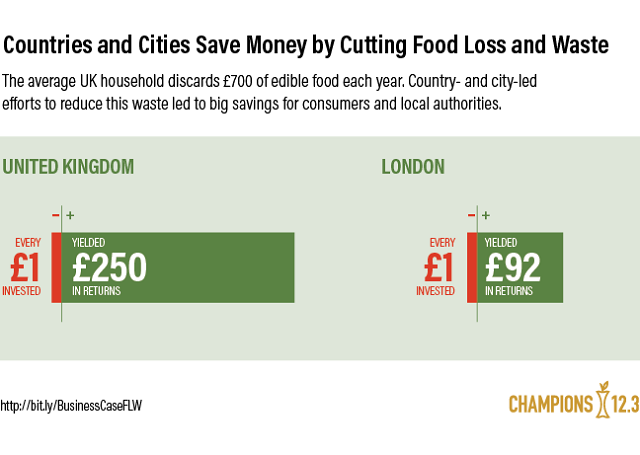 For every £1 the boroughs spent on the initiative, they saved £8 in avoided waste management costs, and households saved £84 on food they otherwise would have purchased and eventually thrown away. In total, some £15.5 million was saved. The success was apparent quickly. After just six months, household food waste dropped 15 percent, an environmental impact equivalent to taking 9,000 cars off the road. London has continued to tackle food waste through the TRiFOCAL project, which aims to engage households, businesses, schools and community groups to promote healthy and sustainable eating, prevent food waste, and recycle more unavoidable food waste. Among other targets, the project looks to reduce avoidable food waste by 20 percent, increase the amount of unavoidable food waste that’s recycled by 5 percent, and save Londoners £300 million by 2019. London’s experience indicates that other cities might also reap significant financial and environmental returns from reducing food loss and waste, and the TRiFOCAL project will provide valuable insights and lessons that others can learn from. These lessons and those from seven other European cities that are replicating the project – including Barcelona, Brussels, Dublin, Milan and Oslo – will be made available in an online resource platform open to city leaders worldwide. The landmark Paris Agreement rallied the world to urgently address climate change. To have a likely chance of limiting the Earth’s temperature rise to 3.6 degrees F (2 degrees C) above pre-industrial levels and for the least cost, global greenhouse gas emissions must hit their peak by 2020 and be cut in half by 2050. Cities, as population centers and hubs of innovation, must lead the way. Mayors, please don’t let reducing food waste be a wasted opportunity. Liz Goodwin is Senior Fellow and Director for Food Loss and Waste at World Resources Institute. She is also Chair of the London Waste and Recycling Board.